Imran Abbas Naqvi is the Pakistani actor who made his Bollywood debut in Creature 3D (opposite Bipasha Basu). Jaanisaar is his second Hindi film, and he plays a prince in it set in 1877 Lucknow. Set in the pre-Independence era, ita��s a love story between a Westernised boy and a culturally rooted Indian girl. Apparently one of the biggest challenges for Naqvi was to perfect the clipped English accent associated with royalty, besides delivering chaste Urdu poetry. Naqvi believes Jaanisaar may not be an obviously commercial film but ita��s likely to be a classic. Now thata��s high expectation indeed. Interestingly he has one thing in common with his co-star Pernia Qureshi: both count Madhuri Dixit Nene among their idols. There is no stopping Sonakshi Sinha. Still in the midst of completing her most challenging role to date, as the lead in AR Murugadossa��s Akira, an emotional thriller about a misunderstood girl who is forced to fight back when she is put in a corner, she announced her next film is a controversial biopic. She will play Haseena, Dawood Ibrahima��s sister, in an underworld story. There is also a home production in the offering. Speaking about her daughtera��s choices and career, her mother Punam Sinha told me that she is content with the path Sonakshi has chosen and her decision making abilities. And shea��s most proud of her daughtera��s professionalism exemplified by her punctuality on set. a�?My husband (Shatrughan Sinha) never went on time. This trait comes from her paternal grandfather,a�? said Mrs Sinha. Ask her what trait Sonakshi has got from her actor-politician father and she replies, a�?Like her father shea��s a fighter who will go against the odds.a�? We have seen models turn into actors, assistant directors and choreographers take on parts in movies and directors get top billing as actors too. So then why should a fashion designer not take a stab at being in front of the camera? In todaya��s release Jaanisaar, Pernia Qureshi, who is best known as Sonam Kapoora��s stylist in Aisha, makes her debut in Muzaffar Alia��s film. Growing up in an Urdu speaking home, it seems Qureshi found it easy to pick up the accent and Avadhi dialect needed to play a courtesan of the 1870a��s. Given her unimpressive dance moves in the songs of Jaanisaar, it is surprising to learn that the debutante actress is apparently trained in Kuchipudi! Jaanisaar is the story of a romance between a courtesan and a prince, played by Imran Abbas Naqvi. One cannot help but wonder about the similarity between Jaanisaar and director Muzaffar Alia��s cult 1981 film Umrao Jaan, though comparisons between Rekha and Qureshi would be erroneous. The verdict is now in: between Mohanlal, Kamal Haasan and Ajay Devgn, Devgn makes for the weakest a�?fourth standard faila�� common man protecting his family in the Drishyam remake. The Hindi version, which released last week, is doing steady business and benefitting from strong word of mouth. However many agree that the bonding between Devgn and Sriya Saran (who plays his wife) and the two children is lacking and the poor casting has further deprived the film of the emotional heft of the original. 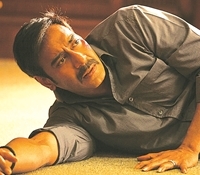 Perhaps Devgn, who has so long been playing the action hero, was rusty when it came to opening up emotionally. In a recent interview while speaking on his own image as the strong hero, Devgn said, a�?The audience doesna��t accept Ajay Devgn as a weak character. I have a certain image and it is very difficult to break that mould.a�? Taking on Drishyam was an attempt to revisit the brooding, intense Devgn seen in The Legend of Bhagat Singh and Company.